He arrived in the Balkans with the Battalion on 8 August 1915 and was Killed in Action two days later on 10 August 1915 aged 22 years at Gallipoli. 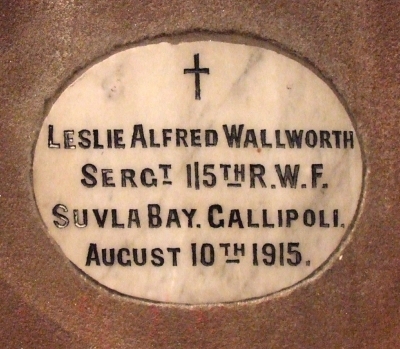 Leslie Alfred Wallworth was born on 21 November 1892 at 23 Rendal Street, Everton, West Derby, Liverpool. The 1891 census, a year before Leslie’s birth states that the family lived at 263 Brook Street, Everton, Liverpool. The head of the family was Harold Wallworth aged 26, who was employed at the Richmond Hotel, Liverpool as the Publican’s Manager. His wife Mary Wallworth aged 22 and their 10 month old daughter, Florence Wallworth. By 1901 the family had relocated to North Wales and they lived at 4 Cross Street, Holywell, Flintshire. Harold was employed in a local public house as a Barman. Mary was also employed in the public house as a Domestic Housekeeper. It is believed that Florence had died by this time. The other two children were Leslie, who is now 8 years old and Maud aged 6. On 2 April 1911, Leslie Alfred Wallworth aged 18 years is recorded as being an Inmate at Bradwell Reformatory School for Boys. It is not known how he ended up there. The 1911 census shows that the family now live at The Old Gate House, Holywell, Flintshire. Harold who is now 46 is employed as a Singer Sewing Machinist. Leslie on returning to the family home enlisted as a Soldier in the Royal Welsh Fusiliers at The Drill Hall, Halkyn Road, Holywell. 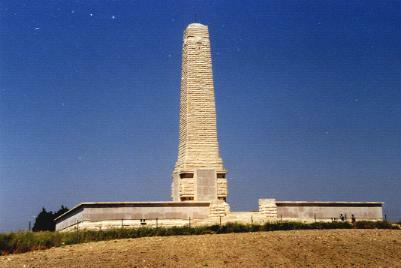 Helles Memorial, which stands on the tip of the Gallipoli Peninsula, Turkey. He is also remembered on the North Wales Heroes Memorial Arch, Deiniol Road, Bangor, Gwynedd, North Wales. There is a Flintshire Roll of Honour card for him at the County Archives Office, Hawarden.